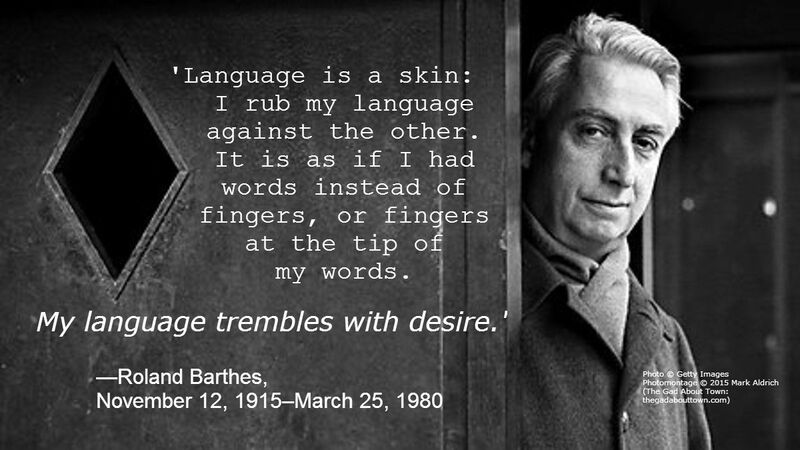 The philosopher, semiotician, literary theorist—the writer—Roland Barthes died 35 years ago today. Reading him (well, a good translation, usually by Annette Lavers or Richard Howard) as a teenager was one of my formative experiences; it was my first conscious experience of my brain expanding with the simple idea that everything is worth notice and consideration. Everything produced by a culture is a signifier of at least that culture itself. His most popular book, Mythologies, is about common aspects of civilization, the items and ideas that make up our modern mythology of ourselves: plastic, toys, striptease, cruises, soap and detergents. Other writers and cultural critics have followed Barthes; perhaps the fact that the job title “cultural critic” exists is attributable to Barthes’ work. Almost every television, music, and film reviewer owes Barthes a debt, but his studies went far deeper than the popular everyday items. The act of writing itself fell under his steady gaze, as did photography. He studied the act of falling in love, as well as the act of mourning. All of these are public acts, even in their private aspects, when we publicly separate ourselves from the public into a private space. The culture in which we live dictates certain rituals, routines, and a particular rhetoric, even in how we fall in love. These he studied, without attempting to explain them from an historical perspective, but to find their deeper significance. When we fall in love, for instance, we “know” we are in love in part because society gives us something of an unofficial checklist of feelings that it thinks we ought to have and in part because we know we are in love with or without that checklist. Barthes searches item after item for the precise moment at which and in which the item, an expression of the culture that produced it, becomes a “text.” Often, as with photography, it is not the point of focus that earns a viewer’s (his) focus; it is something off to the side. Wow… I have never heard of this man,,, He sounds extremely egocentric? I am not sure that this is necessarily bad- in his case? What were reading about this man for??? A class??? (I even googled hi and find him a bit pretentious? I’m not sure if that is the right word. What did you find so attractive about him so that I can look at him through a different lens. If any of this makes sense.) I always enjoy your bio snippets- this one really has me puzzled as a teens interest? Love your writings… by the way. None of this is meant critical. Just inquiring minds- nosiness- wants to know.